An exquisitely photographed introduction to the great French tradition of baking—from the simple croissant to the light and flaky millefeuilles, drawn from the best pastry chefs in Paris. Temptations abound for the sweet tooth in Paris, from the hottest culinary trends to time-honored classics. Pâtisserie is an integral part of the city’s culinary tradition and the source of countless delectable creations that combine fruit, cream fillings, icings, frostings, mousses, and pastry. Readers will yield to sweet temptation as they discover the best pastries and cakes the city has to offer, including macarons, éclairs, baba au rum, tarts, mont blanc, polonaises, and oriental cakes. Twenty pastry chefs show off their artful creations and share their signature recipes, which are described in the context of their historical tradition, composition, and gastronomic properties. The evolution of the pastry art is also explained, focusing in particular on the new generation of Parisian pâtissiers and chocolatiers, buzzing with the creativity and ingenuity that are redefining their craft. 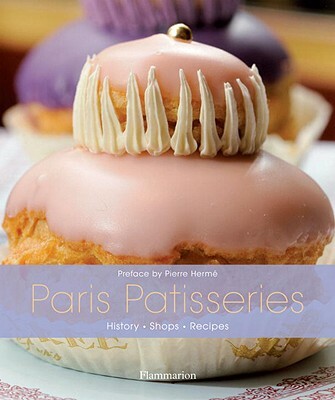 The book includes an address book of the best pâtisseries and tea rooms in Paris along with twenty recipes from the city’s most respected pastry chefs. Pierre Hermé, leading French pastry chef, is internationally renowned for the quality and creativity of his pastries. Christian Sarramon is a distinguished lifestyle photographer. His work has been featured in Axel Vervoordt: Timeless Interiors, Provence Style, Living in Paris, Living in Provence, Gourmet Shops of Paris, Gourmet Bistros and Restaurants of Paris, and Yquem. Julia Hung is a journalist for a number of culinary publications in France.